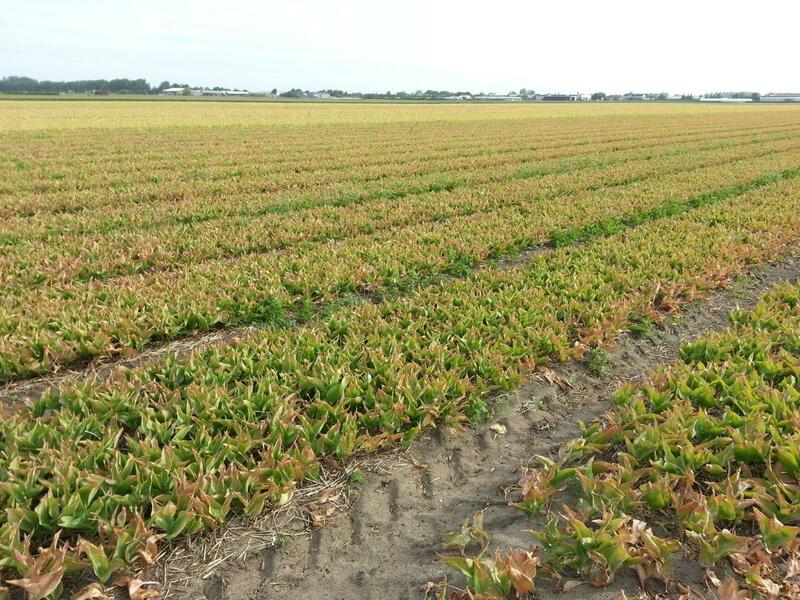 About field conditions, I made short visit in Lisse area today. The early tulips, is picture of botanical type. The color is starting to become brown and grower said that in past weeks bulbs enlarged well. Last year, already he started harvest. It is about 2 weeks later now. But for Botanical types, we think that it is not a problem at all to harvest later. Second picture: Darwin Tulips. This is also Lisse area. Foliage is getting light green but not brown yet. It is now growing bulb. Conditions in next 7 days are expected to be very good for growth. We expect such fields to make strong growth peak this week. 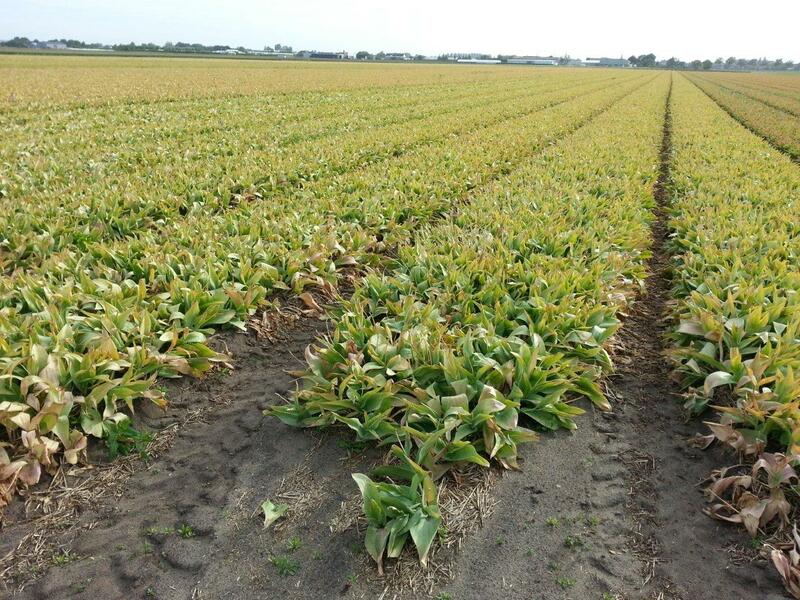 I noticed one grower was cutting off the foliage already to force the tulips to go dormant for early harvest. Apparently, there must be enough growth in these bulbs already. I was surprised. Last picture: Early and late tulips. This shows Darwin in front and triumph in back of field. Clearly, the Triumph in back is still very green. Nothing turns light green or brown yet. They are growing fast now and under these current weather conditions it will result in good bulbs. Middle of next week is expected for higher temperatures. Some predictions think it will be 23-15 degrees. But it is not sure yet. We do expect light rain also. 1: harvest delay is about two weeks compared to normal year. 2: Stage G is delayed up to two weeks compared to normal year. Growers mood changed compared to one month ago. They are now more relaxed because they have seen good conditions and growth in past 3 weeks. The tulips still look good. Early harvest is not possible, but growers now start to think that crop quality and quantity may be rather good. This is very much different than mood one month ago. Also in Zeeland, the crop still looks good and strong. Very green. Growth is slow due to weather. Hyacinth needs to have some warm weather to increase bulb size. But so far we did not get such weather. Expected is that normal hyacinth will finally grow to normal size. Maybe later harvest, but size can be normal. 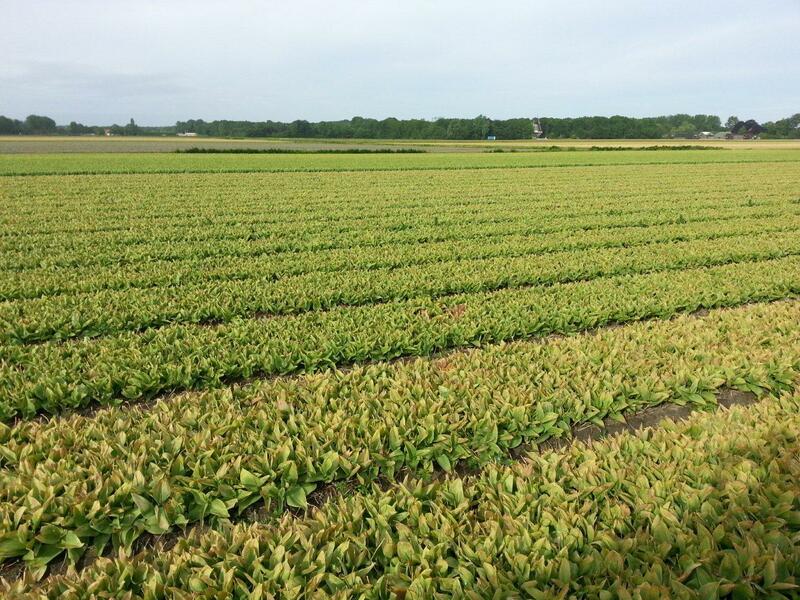 Prepared Hyacinth will be difficult because they need to be harvested early and good size has not been reached yet. This is big worry for growers. Many prepared bulbs are used for early Christmas forcing. Ordering from Japan is still very slow. Drysale is only 35% ordered. Terribly slow and difficult for us.